Dubai, September 20, 2018: Building on the huge success of its 2017 debut in the region, the second edition of Huawei Middle East ICT Competition, the Ministry of Human Resources and Emiratisation, Huawei and Honor launched the competition in UAE and invited universities and students to register before Sep.25th. The competition is designed to prepare the next generation of ICT leaders and uncover the local talent who will lead UAE into an intelligent world by pursuing Vision 2021 for digital transformation. The Ministry of Human Resources and Emiratisation aims to develop specialized sectors of the economy by focusing on building the skills of the UAE's human capital and concentrating on securing employment opportunities for young Emiratis in the private sector. The cornerstone of the Ministry's strategy is to collaborate with all relevant partners to establish a comprehensive human resources ecosystem. In the past 30 years, the Ministry has made many efforts to train ICT talent by teaming up with educational institutions, industry associations, and partners to build an enablement platform for ICT talent to empower the rising generation, refine their talent and shape the country's future. The year's edition of the competition will run in 10 countries, particularly in the United Arab Emirates, as it aims to increase national ICT competitiveness and promote innovation and creativity, a staple to build knowledge-based economies. Throughout the competition phases, participating students will gain knowledge and experience in the latest ICT technologies through course material on advanced IP and IT and offers them a glimpse of 5G technology which is set disrupt the way business is carried out. The competition will also allow the participants with the opportunity to conduct field experiments at Huawei's specialized labs and research centers to equip them on how to tackle complex challenges in areas such as cloud computing, IoT, and network security. “Over the years, we have been committed to knowledge transfer in the markets in which we operate through several CSR initiatives that train and support the youth. 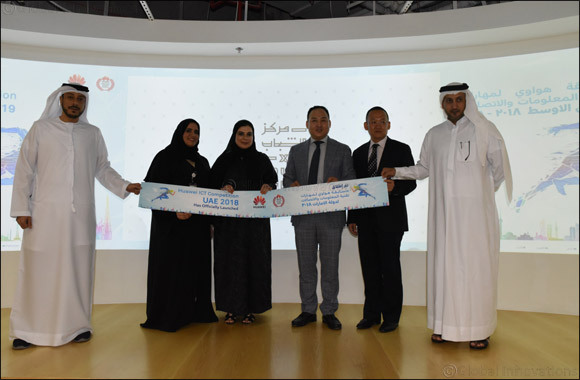 As we pursue our new vision for an intelligent world where every person, home and organization is fully connected, it is time to nurture a generation of ICT leaders that are capable of moving their countries into the next stage of digital transformation,” said Mr. Spacelee, the President of Public Affairs and Communication, Huawei Middle East. The top skilled teams will advance to the Nationals stage, which will take place between October and November. National winners from each country will receive an all-expense paid immersion trip to Huawei's global headquarters in China. This will give them an unrivaled exposure to leading global ICT expertise, an opportunity to meet the brand's leadership and a priceless cultural experience and knowledge exchange. The international winners will receive certificates, trophies and cash prizes, in addition to employment opportunities at Huawei for the most outstanding candidates. In 2017, the winners were selected following a grueling six months of qualifying rounds that saw participation from more than 10,000 students from 121 universities across the Middle East. This year, Huawei ICT competition engages Honor to be one of the Sponsors. Honor was envisioned as a young, energetic and internet-centric brand, and it will bring the competition a brand new look.